Electricity Supply Industry (ESI) workers hold qualifications relative to their position and tasks. As safety is a priority when working in dangerous environments, first aid and CPR attainments are essential for workers across the entire industry. Real Response introduces immersive learning techniques that result in greater knowledge retention, with at-ready skills for providing emergency first aid and CPR when emergencies arise. Provide First Aid in an ESI Environment (UETTDRRF10B) has been specifically formulated for electricity industry occupations where low-risk, high frequency accidents and emergencies arise. What are the guidelines when completing a first aid course in an ESI environment? Due to the dangerous nature of many electricity supply occupations, employees often work alongside one or more colleagues. Creating a safe work environment is a major priority, dramatically reducing the need for accident and emergency response. How is first aid assessment made for workers on ESI networks? Compliance regulations, including occupational health and safety rules, are all pervasive across Australian society, and attaining nationally recognised accreditation provides employment prospects in wide ranging ESI occupations. The first aid and CPR life-saving skill-set has improved dramatically in recent years thanks to the introduction of portable emergency equipment familiar with paramedics and other emergency responders. Provide First Aid in an ESI Environment contains the most common emergency first aid procedures relative to the electricity supply industry, and course participants are expected to reach acceptable first aid competency levels that translate accurately into real life emergency response. ESI emergencies range from trips and falls to electrical burns, bleeding, shock and cardiac arrest, making UETTDRRF10B as taught by Real Response a life changing and life-saving experience. 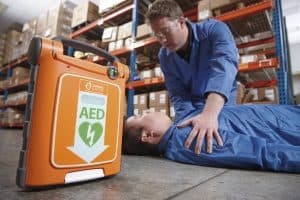 What first aid principles are unique to UETTDRRF10B Provide First Aid? First aid and CPR techniques used in the electricity supply industry are adaptable to other situations also. In this sense, first aid attainments really are for everyone, and Real Response is committed to the spread of high-quality training across the country. Australians appreciate safety, security and good health, with Real Response at the forefront of change. Additionally, the course attainments are tailored for industry-specific purposes, facilitating group training with safety conscious employers. As work in the electricity supply industry typically involves high voltage equipment or hazardous environments, workers need to be deemed competent to carry out their respective tasks. Untrained first aiders, although brave, may also be incredibly foolhardy when attempting first aid, putting themselves and others in danger; a situation easily avoided with relevant industry training. Although some first aid or CPR response is usually better than nothing, a highly trained and competent Real Response course graduate is far more likely to carry out an exacting emergency response free from errors of judgement. Real Response professional instructors create unique learning environments tailored for every specific ESI occupation, with life-saving results.